Jimmy Garoppolo got the Tom Brady treatment from the Patriots' coaching staff. 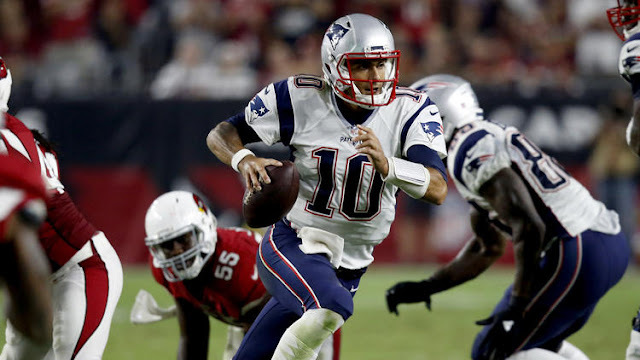 Bill Belichick, Josh McDaniels and company didn't alter their offensive playbook at all for Garoppolo, which ultimately led to the Patriots upsetting the Cardinals in Arizona last Sunday night. It was clear from the opening drive that the Patriots were going to go full throttle. Garoppolo hitting Chris Hogan deep down the sideline for a touchdown on New England's first drive was evidence of that. Matt Bowen of ESPN.com has an in-depth recap of the Patriots' play-calling during the game, which you can read here. Bowen highlights how Garoppolo used Julian Edelman a lot, and how Edelman didn't really have to change the routes he runs to fit Garoppolo's strengths. He also touches on the pick routes they used to covert third downs, play action passes and 2x2 spreads with four tight ends on the field. Moreover, this was a telling sign for Garoppolo. It's now clear that the coaching staff has full confidence in the young quarterback to make the plays Brady would make. They're giving Garoppolo freewill to chuck the ball all over the field when the opportunity presents itself, change the play at the line of scrimmage, and so on. Garoppolo didn't just manage the game on Sunday night. He helped win it. Obviously, things can change at the drop of a hat, but the fact that Garoppolo was able to beat a Super Bowl contender in his second-career start (he started Week 17 against the Buffalo Bills in 2014, but no one seems to remember that) should give people a lot of hope that he'll be able to lead New England to a couple more victories until Jesus returns to the field in Week 5.